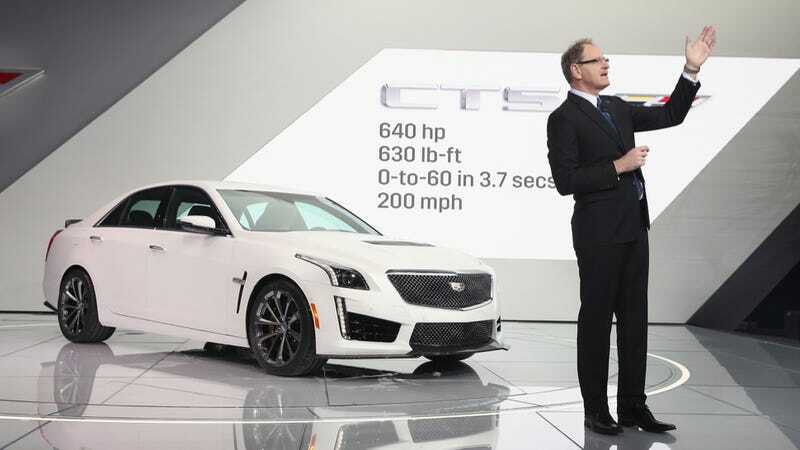 Yesterday, Cadillac President Johan de Nysschen stopped by for a fantastic live Q&A session. The problem is, he got far more questions than he had time to answer in just an hour. So he's answered some more, and just told us that Cadillac will debut an entirely new family of V6 engines next month. Whoa. Here are the questions he decided were worthy of a response. If yours was answered, congrats! And if your question was in the grey and he answered it, you've been promoted out of the grey forever (or until you say something that earns you demerits in the eyes of the public). It's still a little early to release specific pricing detail, but obviously it will fit in above the XTS and CTS in pricing. It's complicated to price new- technology lightweight cars- it costs a lot of money to reduce weight, but it enables engineers to extract great performance from smaller engines, because the power to mass ratio is great even though the engines produce less power. The result is excellent handling and braking due to reduced inertia, and improved fuel economy. So where is the problem? Some are accustomed to considering price position via engine displacement and/or horsepower. When a 2.0 turbo replaces a V6, many may not be comfortable about paying the same price for fewer horsepower, even though it delivers better all-round performance. We will have to get the market accustomed to paying for performance, not for horsepower. ELR will receive significant technical updates soon. The car is beautiful to look at and great to drive. We've made the investment and it gives our portfolio something very unique. This is probably a matter of personal taste. This is often overlooked: Cadillac is the only full-line luxury brand that employs "cut-and-sew" interiors across the board. If you carefully study the execution of the interior fascia, you will indeed notice that in Cadillac models, only the highest grade of authentic woods, and leathers are used. The cut and sew craftsmanship offered in even the ATS, is encountered only in top-end models at much higher prices from our competition. Future design thematic will move towards simplified, horizontal-theme expression to convey openness and a sense of wide space, maybe less brightwork, and a lot of emphasis on instrument cluster design to convey them as precision instruments of functional and aesthetic beauty. This evolution will be triggered by CT6. We like real names for cars too. But what works in an English-language market like the US, does not necessarily work elsewhere. The Germans discovered this a long time ago. Eldorado conjures up romantic memories here in the US, in China people are uncertain how to pronounce it. Luxury brand buyers, especially in foreign markets, also like to know the position of a particular model in the line up of a manufacturer. Alpha numeric names make this easy, they are international. Escalade is sold primarily in the US, so its easy to keep the name here. CT6 seems odd all by its lonesome self. When a full line up of cars, in escalating sizes and price points are expressed in CT2, CT3, CT4, CT5, CT6, CT7, CT8 and CT9, it becomes a lot more logical, even if its not particularly romantic. Hopefully the awesome cars will provide emotional inspiration. And we have an exceptionally well-known, respected prestigious and emotional name — Cadillac. We are doing this very successfully in China, where all Cadillac dealers are exclusive stand-alone stores. It is easier to achieve when you are designing your network from scratch. It is not so easy in the US. We have 928 dealers, compared to roughly 350 from the leading competitors. This means they can concentrate their sales through fewer dealers, at more profit per store, and can afford to invest in impressive stand-alone showrooms. Yet many of our small Cadillac stores have been in family ownership for generations, and these dealer partners have invested their lives in support of Cadillac. We have over 200 large exclusive Cadillac stores focused only on Cadillac, and overall, JD Power rates Cadillac customer satisfaction as #1 among luxury brands. Nevertheless, moving forward, we will be working closely together with our dealers to turn our proximity to customers into a real competitive advantage, with focus on consistently delivering a brand-defining top quality customer experience, through classy yet compact smaller but brand-pure exclusive showrooms in rural areas, staffed by well trained top calibre people and consistent processes. Perfectly timed question, as the brand new ATS-V race car will begin the Pirelli World Challenge campaign next week in Texas. As for long-term ideas to expand in racing, this is under study at the moment, but no conclusion has yet been reached. Personally, I am a big motorsport enthusiast, so I favor strong engagement, the question is, which is the most appropriate format in which to participate? Get good grades and immerse yourself into knowing all there is to know about cars. Then write to me one day and explain why you would make a great intern for Cadillac. We are extremely proud of our heritage and it will continue to play a very central role in defining all that Cadillac stands for. It is indeed a commercial success but I am not sure if it does the brand any favors. But that is just my opinion. These conversions are done in the after-market, so it is not much of a consideration in the development process. CUE has already received some software updates, further hardware updates will happen in MY 16, and as with all things, an all new CUE system will see the light of day a few years into the future. Right now, our greatest advantage is that we are "undiscovered". Very few people realize just how good cars like ATS and CTS are vs the traditional market leaders. The original concept of aspirational "exclusive" brands lay precisely in the fact that they were difficult to acquire and therefore the domain of the few. To their credit, some of the leading premium brands have become so successful, that today they are hardly the domain of the few. Cadillac does not aspire to be the biggest. But we want to re-occupy the position as the most respected and revered aspirational brand. Even though we have a good starting position, we know it will take many years before people besides the informed circles know this. It requires careful crafting of the products, the brand management, the ownership experience and the dealer network, to name just a few. The transformation of the Cadillac brand actually started back around 2002, with vastly improved products. The execution of the brand strategy must now follow- the engineers have run ahead of the marketers. But we start the next phase with the benefit of world class product in ATS, CTS and soon, CT6. But there are truly magnificent further products under development. Great question. We have an entirely new family of V6 engines coming soon, premiering in CT6. We will release technical details of this next month. Today's twin turbo version could hardly be described as lacking power or refinement- the latest version, in the ATS-V, for example, comprehensively eclipses any comparable offering from Germany. I currently drive a CTS V Sport, my first car was a VW Beetle which I owned for less than 24 hours before I rolled it. Not a great start.